Here you can stay up-to-date with the most recent additions to Lower Back Pain Answers. Continue reading "Lower Back and Hip Pain - 7 Overlooked Causes"
Continue reading "Lower Back Pain Answers: Relieve Your Back Pain NOW"
Iliopsoas Syndrome, the not well-understood dysfunction of the primary hip flexors, can be healed using the 4-phase system developed by Stephen O'Dwyer, CNMT. Continue reading "Healing the Hidden Root of Pain: Self-Treatment for Iliopsoas Syndrome"
Desk Stretches for lower back pain using Active Isolated Stretching is more effective than static stretching. A simple stretching technique you can do any time at the office. Continue reading "Desk Stretches for Relieving Lower Back Pain at the Office"
Contact Lower Back Pain Answers with your comments and suggestions. 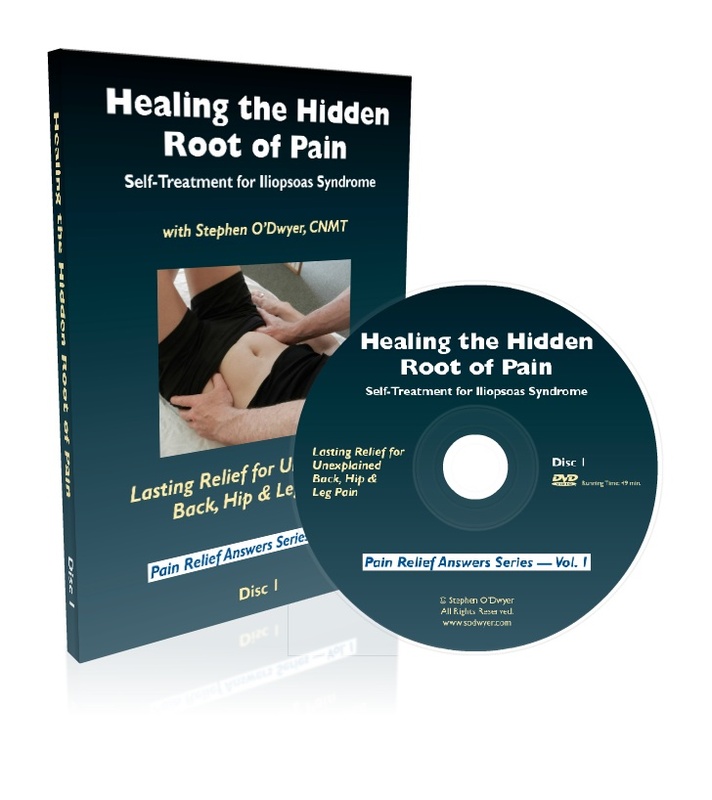 Continue reading "Contact Form at Lower-Back-Pain-Answers.com"
Biographical information about Stephen O'Dwyer, CNMT, the site author of Lower-Back-Pain-Answers.com. Continue reading "About Site Autho of Lower Back Pain Answers"
Continue reading "Iliopsoas Syndrome: The Hidden Root of Pain"
Continue reading "Grandmother in pain "
Continue reading "Tired of the pain." Continue reading "Possible Iliopsoas syndrome? Don't know"
Continue reading "Questions about my pain"
Provided here are links to directories and guidelines to assist you in your search for a Massage Therapist or Neuromuscular Therapist in your region. Continue reading "Find a Massage Therapist or Neuromuscular Therapist"
Nerve compression and nerve entrapment are one of the five primary causes of lower back pain. Continue reading "Nerve Compression and Nerve Entrapment | Two Distinct Causes of Pain"
Spinal Stenosis typically affects individuals over the age of fifty and is characterized by a narrowing of the spinal canal. Continue reading "Top 10 Benefits of Stretching"
An extremely effective set of core abdominal exercises for strengthening the lower, middle, and upper abdominals while keeping the lower back stable and pain-free. Continue reading "Core Abdominal Exercises: Part 1"
Provided here is an excellent index of lower back pain remedies. Many of them are also appropriate for middle back pain and upper back pain. Continue reading "Lower Back Pain Remedies: Innovative Therapies and Strategies"
Rolfing is a hands-on method of lengthening the soft tissues of the body to restore balance with gravity, improve freedom of movement, and relieve chronic pain. Continue reading "Rolfing | Restoring Balance Means Relief from Lower Back Pain"